Thank you all for your kind responses on my last post. Sometimes, when you put your thoughts out there, you don't know what kind of response you will get in return. I was surprised and comforted to see that many of you are feeling the same way. You've freed me in a way (if that's the word) to talk about more and varied things here on the blog. I hope you'll continue to enjoy what I have to say! In the downtime of the holidays, we tackled one lingering home project. 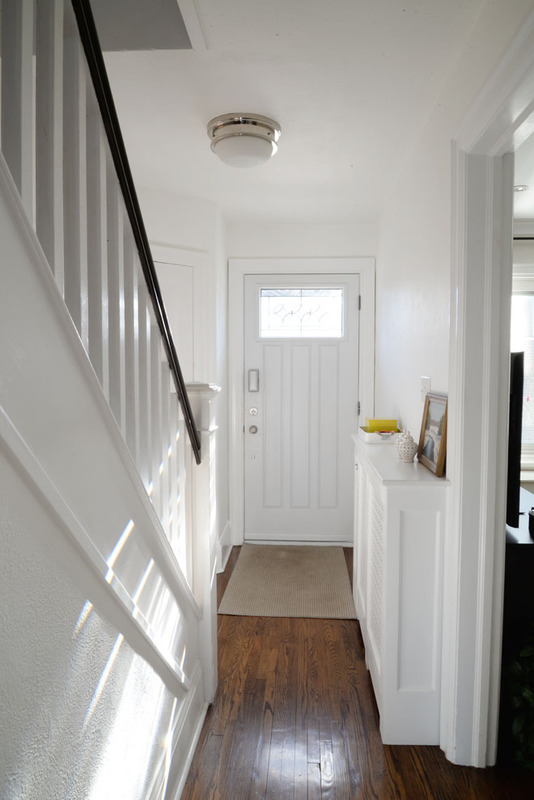 One of the first things I did when we first bought this house was paint the entryway and hallways. It was a brownish-charcoal-grey, very 2008, and I painted it while Sean was away on a business trip. If I'm being totally honest, I was over the grey by, oh, 2011. That's a long time to live with a paint colour you don't love but you know how these things go. In classic style, we lived with the grey until the holidays. It's only when we're cooped up for a stretch of time that we're inspired to focus on a lingering project and actually get it done over a few days. It's how we spontaneously tackled our first home office and the next Christmas our main bathroom. And now it was time to give the hallways a makeover. Despite my last post about everyone everywhere painting everything white (ha! ), I went for white. In small spaces, you can't beat white's space-expanding abilities. It took a few tester pots to get the right white but I finally settled on Benjamin Moore Simply White, the colour of the year in fact. 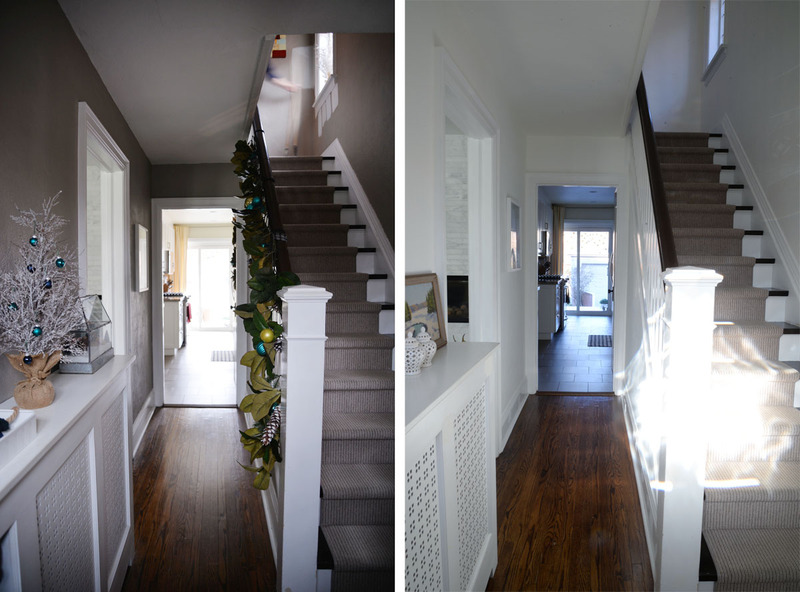 Our trim is painted in Benjamin Moore Distant Grey, a crisp clean white. Simply White is more of a neutral dull white. It's not sparkling or stark nor is it warm and creamy. It's the colour of an eggshell... plain and inoffensive. Liveable. 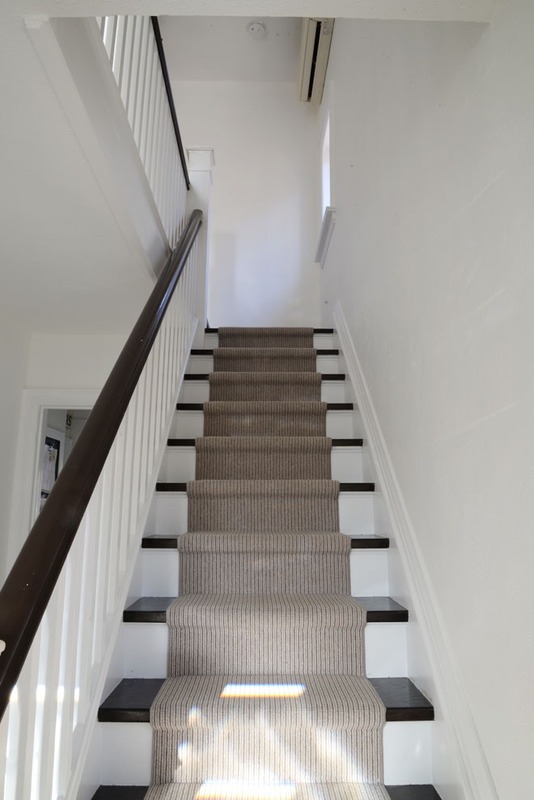 We started with patching the walls, removing the old baby-gate latch, filling in nail holes. The timing was perfect as DAP Canada had sent me a gift box of their products to try. 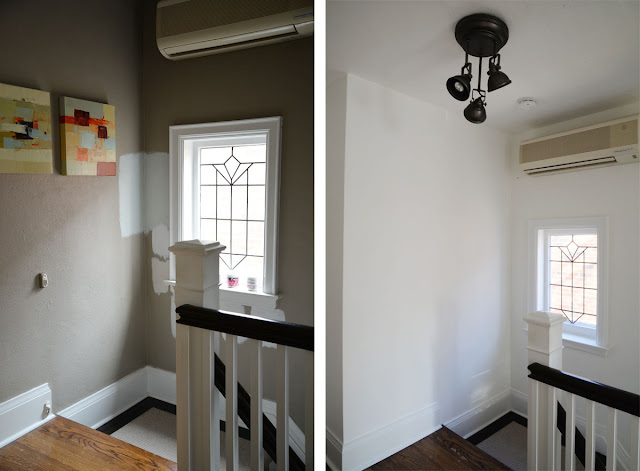 We used our favourite wall patch, DAP DRYDEX Spackling. It goes on pink and turns white when it's dry and ready to sand. We followed this with a coat of primer (I love the Kilz brand) to ensure that the grey wouldn't bleed through. We used the white paint on the ceiling and walls in an eggshell finish. 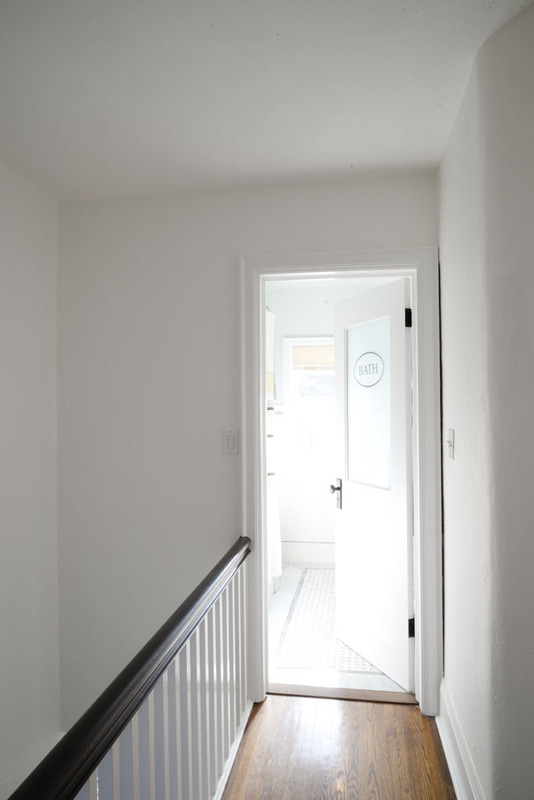 Two coats of Simply White and our hallways were looking fresh and bright. We'll finish up by repainting all the trim and adding new art. The new paint had a few unexpected effects. Sean has always disliked the light fixture over our stairwell as he felt it didn't cast enough light. But with the new white walls, the light is totally sufficient! I never realized just how much light our dark walls actually absorbed. 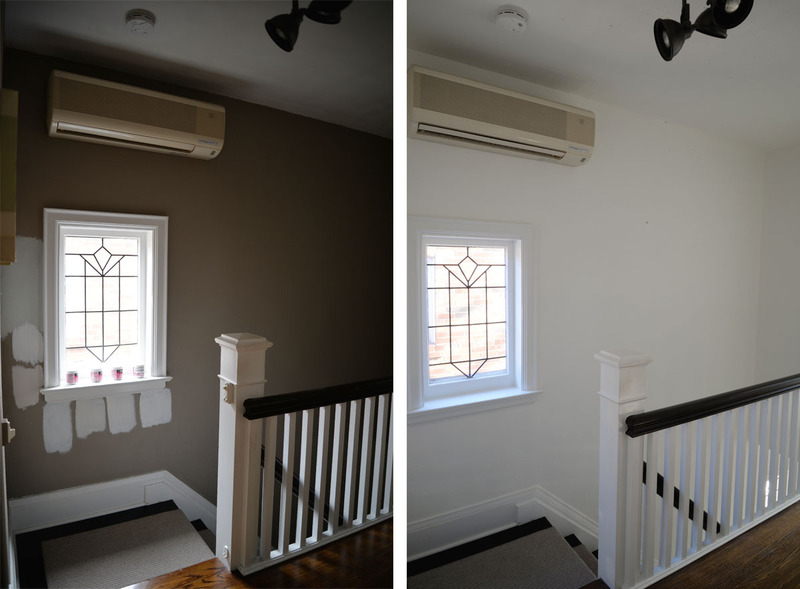 Lesson learned: If your room seems dark, wattage might not be your problem, it might be your wall colour! Another lesson learned: white will make your other off-whites look terrible. We really should replace that unattractive, old, loud air conditioner over the window. We've been meaning to replace it for years (it's always rattling) but this new wall paint might be the impetus. That, my friends, is known as "scope creep"... when one home project inevitably leads to another home project. So, do you have any walls in your house that need a makeover? Who else is living with 2008's charcoal grey? ?